9 March. An open invitation to all, to share & be inspired via Islam's Golden Age. A day for knowledge, peace, love and unity for all humankind. And the launch of #WID - what golden knowledge will you share? This is a site that will not accept hate, dogma or rhetoric. Nor is it sponsored, affiliated to any political, religious or sectarian cause. This website is open to all Muslims (at all stages of faith) and non-Muslims. Peace. March 9 - Join us? This is a site for the genuinely curious. Who perhaps is becoming or has gotten scared of the Islam they hear, watch, listen or read about. 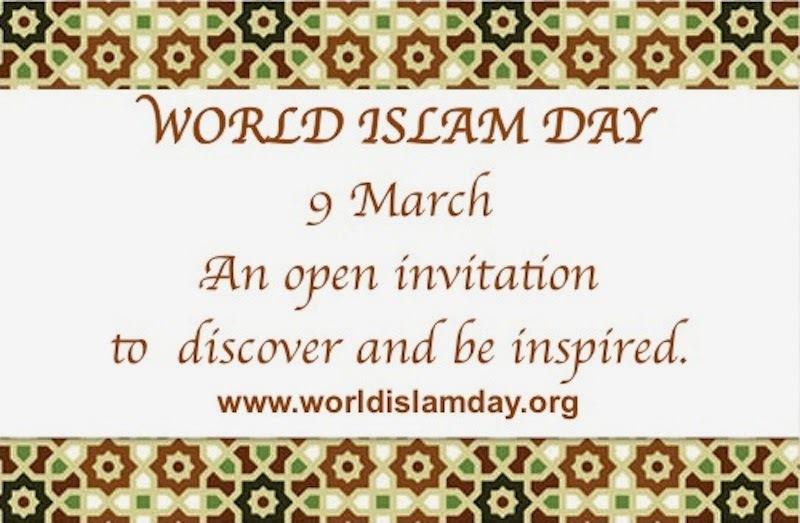 Someone came up with the idea of World Islam Day. I know, as Wiki tells me here. Who this person is, I hope to discover. And thank him or her. The idea is on 9 March - post or tweet a piece of knowledge. Either something that inspires you in Islam. Or something that might inspire a Muslim. Anyone can join in, regardless of faith, race nationality. More details on how to use hashtag #WID is here. And, it seems someone else in America is really trying. "Terrorists traffic in lies and stereotypes about others -- other religions, other ethnic groups. So let’s share the truth of our faiths with each other."